You're probably wondering how this company name came to be right? Well here goes...a cute friend I had a while back thought it was a fitting name for me for some reason that I don't know of. It was around the time that Destiny's Child's single Bootylicious was popular so Evalicious was born. When I was active on 2peas and scrapbook.com a few years back, I needed a stage name so Evalicious just stuck with me. My stage name then became my company name in May 2008 when I started offering my embellishments, memory art kits & handmade books for sale on evalicious.etsy.com. Evalicious now represents me & the fun stuff I make. My name is Eve Johnson (used to be Tran), I'm wife to Edwin and mama to Golden Retriever Mylo. I'm 32 years old, a part time nurse and living my dream designing for and managing my online shop. I've always had a dream ever since I graduated from my nursing program in 2003 to one day go part time or leave the profession altogether so that I can create things full time. For some reason, I wasn't as passionate about nursing as I thought I would be. It's hard work and sometimes not very good for me mentally:(. That's a whole other story LOL! Now, life just can't get any better...I only have to "be a nurse" 3 days a week and I get to play in my studio all I want the other 4 days of the week:). With more play time in the studio, I'm happy to say that I can design and put out kits more regularly and create more new fun things to keep my shop fresh & interesting. My artwork has been published in Creating Keepsakes, stamp It Cards, Scrapbook Trends, Canadian Scrapbooker magazines. I'm also the winner of Creating Keepsakes magazine's "Turn In Your Friend" contest in 2006 and one of Scrapbook.com's $20K 2006 contest winners. Many thanks for sharing about you. 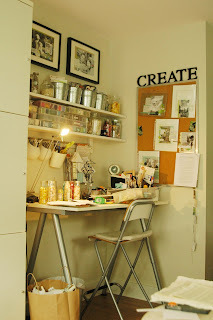 I also met you in Ali Edwards's blog and since them I've been admiring your products regularly in etsy. I was happy to discover also your blog. Thanks Eve for telling us about you! The blogging community is somewhat new to me and I've been reading your blog for months. Honestly, I forget where I came across it... and instantly fell in love with your style and shop! Can't wait to see more!! but just wanted to tell you that i love your blog and enjoy reading it!